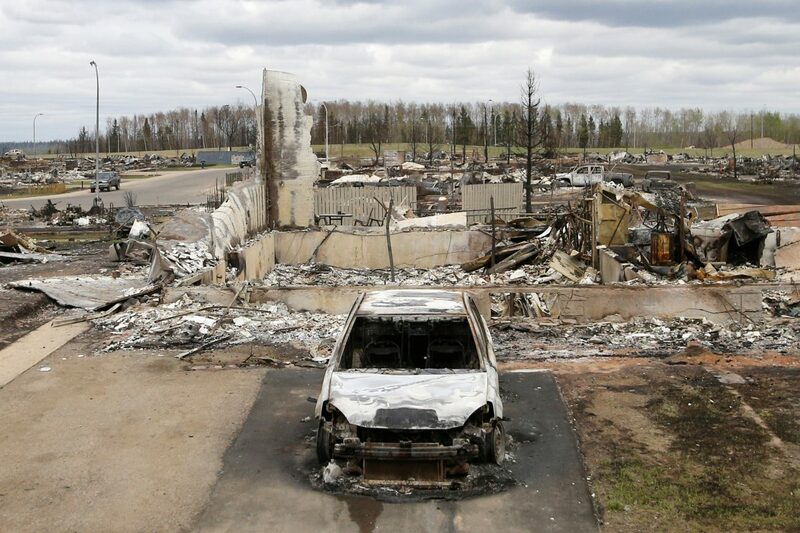 EDMONTON, Alberta (CNS) — While video and photos of the raging inferno that destroyed much of Fort McMurray were being flashed around the world, Jason and Katharine Campbell and their two sons were expressing gratitude for all that they still have. “We’ve been focusing on gratitude because it’s easy to relive the horror stories and relive the disappointment and the fear,” Katharine Campbell said following a May 8 Mass for evacuees at Edmonton’s Resurrection Church. “Every night before bed we’ve included a gratitude prayer and the boys (Ryan and Evan) have had to think hard about what they’re most grateful about,” she said. Katharine Campbell is an English teacher and Jason Campbell is vice principal at Holy Trinity Catholic High School in Fort McMurray. They were part of a group, mainly associated with Catholic schools in the evacuated city, who packed the church for a special Mass celebrated by St. Paul Bishop Paul Terrio. When Holy Trinity Principal Lucy Moore fled the school May 3, she took only her laptop with her. In that laptop were email addresses for staff and parents of students at the school. In the five days prior to the Mass, she sent three emails to her entire list, which helped organize the Mass. 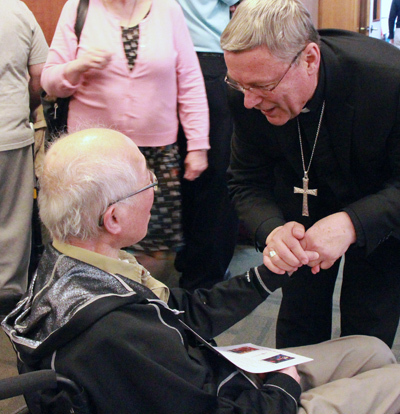 The coming-together of Fort McMurray Catholics late in the afternoon on Mother’s Day brought forth countless hugs and tears. “You’re joined; you’re a community; you’re one body in Christ,” said Moore. While no one knows how long it will take before residents return to the oil-sands city, Moore is determined that the school hold its Mass for graduating seniors by the end of June. Monica Mankowski, deputy superintendent of the Catholic school system, said the Mass was an opportunity for Fort McMurray Catholics to pray and grieve together as a community. “We are so grateful to have everyone safely out of Wood Buffalo,” said Mankowski, who took a group of 14 in a van to spend a couple of days at her family cottage near Boyle, southwest of Lac La Biche. The bishop said that among the people at the May 8 Mass was Deacon Raymond Chan, who serves in the Fort McMurray’s St. John the Baptist Parish. Deacon Chan uses a wheelchair and is unable to speak; his ministry is one of prayer. Still alert, he shares his reflections weekly in the parish bulletin. In response, Deacon Chan raised his one good thumb. The Campbells, who came to Fort McMurray 11 years ago from Cape Breton, were planning to head to Nova Scotia to stay with family until they hear that their school is re-opening. One reason for their gratitude is that they were contacted by friends whom he had not seen in about 15 years. The friends learned through Facebook that the Campbells were leaving Fort McMurray, and somehow they found Campbells’ phone number. “We’ve stayed on their farm for four days,” Jason Campbell said, adding that meant their sons did not have to experience the stresses of living in an evacuation center. The Mass at Resurrection Church was a joyous time to reunite with their support network, the couple said. “This is family for us. This is the family we see every day,” Katharine Campbell said. Argan is editor of Western Catholic Reporter, newspaper of the Edmonton Archdiocese. Morningstar is a reporter at the paper.